When a student asks me these questions, I hear their longing to fulfill themselves as a musician, along with their anxiety and fear that they may not be able to accomplish what they hope to. I may tell them that they have a lot of potential, great coordination, or a good ear, or that they are wonderfully musical or even extremely talented. But regardless of how I answer their questions, the most important thing to me is where their questions are coming from—why they care so much about their possibilities for making music. It is that caring place, the heart of the person, that will determine how receptive they are to my teaching, how intelligently they will be able to work, and how much they can learn and grow through their study with me. The more I teach, the more I see that people are capable of incredible things when they are deeply motivated. Each student, whether amateur or professional, surprises me with how far they can go with their playing, and with who they become as a pianist. And all along the way, as their talent continues to develop, their playing keeps flowering in new and beautiful ways. I have written many articles about practicing and performing. But I decided to write now about teaching, which has been my great passion for the last 30 years. So many musicians suffer from self-doubt, and even debilitating stage fright, because they have not received all of the support and guidance they need in playing their instrument. We live in a culture that doesn’t generally recognize how complex and challenging it is to master an instrument, or what is involved in teaching a musician to accomplish such mastery. We often focus more on how many hours someone practices than on the actual quality of their work, just as we tend to focus on measuring and evaluating people in general—in the school system, in the corporate world, and in the world of music education and competitions. But in the middle of all this measuring and judging, the most effective teachers know—whether they are teaching in an elementary school or in a music conservatory—that although students may benefit to an extent from meeting the challenge of the next test or jury exam, they can only fully thrive when a teacher sees and respects the wisdom and beauty within them and can guide them toward connecting with it and unleashing its power. Since childhood, I have been struck by the power of the relationships I had with my piano teachers. Other musicians have also told me about the enormous effect their teachers have had on them. When I was a conservatory graduate student and making my living primarily from teaching piano, I wanted to understand the nature of this relationship more, so I did an independent study project on the teacher-student relationship in the private music lesson. As part of the project, I read about 10 books on teaching, and I also circulated a survey among students and faculty to find out how much they understood about each other. For the students, the survey included questions about how they felt during lessons, what they most wanted from their teacher, and what they considered to be the main responsibilities of a teacher and of a student. It also asked them to guess how teachers thought and felt on these subjects. For the teachers, the questions were reversed: they answered questions about their own feelings and thoughts on these subjects, and also about what they thought students felt in these areas. Although I no longer have those surveys, I vividly remember learning one main thing from the completed surveys I received: With one exception, the teachers were not aware that the single thing students most wanted from them was to be understood as a person. This was more important to them than any specifically musical things they were learning. Of course, every student is different, as is every teacher. And there are so many essential things that a music student needs from her instrumental teacher. I have spoken to musicians who simply craved knowledge and didn’t care if their teacher liked them or understood them as a person. But I have also found in my own teaching that the personal relationship I have with each student has a very significant impact on how well they are able to play. Music is so deeply personal, and it involves all of ourselves—our, body, mind, heart, and sense perceptions. And it requires all of these to work in concert—which is an interesting word here. When a musician performs in a concert, they are connecting their own heart and mind with the heart and mind of the composer and audience. To do this, all of their faculties—body, mind, heart, emotion, ears, sense of touch—must operate together in a harmonious way. Teaching someone to do that also necessitates a complete, harmonious synthesizing of all of these elements during each lesson. So a teacher must know in depth how body, mind, heart, ears, and touch all work, and how they constantly affect each other. Anyone who has spent much time practicing an instrument knows that you can’t really separate technique from music—that the way you move changes how your instrument sounds, and that conversely, if you don’t shape or organize a phrase to best effect, your body can feel somewhat awkward as it tries to flow along with the music you are making. In addition to developing this understanding, we also become familiar with another key experience: When a thoughtless teacher or other listener makes an unkind comment about our playing, we can easily become physically and emotionally tense, so that our expressive capacity suffers or even shuts down. For a student to feel safe to fully express herself in a music lesson, she has to sense that her teacher is right there with her, hearing not only the sounds she is making but what she needs as a student and person from moment to moment. This is a tall order, and all teachers make mistakes. But if the quality of communication between teacher and student is open and trusting, and if the teacher is also highly knowledgeable in matters of technique and musicianship, the entire experience, for both the student and the teacher, can be extremely rewarding. For in giving a music lesson, we are putting together the components of being a real artist and human being—we are helping someone open up the treasure of their gift and to display it and offer it to others. Teaching in this fully human way requires a whole new set of skills from what we are taught in school. The main skill we need to develop is receptivity. And it starts with being receptive to ourselves. We have so many habits as teachers. We want to give our students lots of information and advice. We may say, “Play it this way,” and then play it for them, expecting them to copy what we do. Or we may instruct them to phrase it a certain way, finger it a certain way, pedal it a certain way, and feel it in a certain way—all without being the least bit aware that they may be feeling really vulnerable or confused—that they may need to tell us what’s going on with them, or what they understand already, before we open our mouth and tell them all our ideas. The more we can be aware of such habits in our teaching, the more options we have for genuinely connecting to each student in each moment, so that we can understand who they are, how they feel, what they know, and what they need from us. A lesson is like a piece of music in that way—it is a moving stream of human feelings and intelligence. To swim in that stream, we have to be aware of the current and to swim with it, not against it. A student can only absorb what they are ready for. Our job as teachers is to sense what they are ready for, to ask them questions if we are unsure of where they’re at, and to do our best to open to them, person to person, explaining and exploring things in a way that works for them. We can only do this if we are willing to learn a great deal ourselves in the process. Ideally, we need to be able to really enjoy teaching as one of the most meaningful and creative activities we could engage in. One of the books I read when I was doing my independent study project in graduate school on the teacher-student relationship was Freedom to Learn, by Carl Rogers. He describes the teacher as a “facilitator of learning.” And one of the first questions he recommends that a teacher asks a student is, “What do you think?” As soon as I started asking that question of my students, teaching became a completely different experience for me. I got to know who my students really were – what they thought, how they felt, and what they already knew. I discovered that a lot of what I had to tell them wasn’t necessary, because they had already perceived the same things that I had in their playing. So many students are not used to teachers being curious about them in this way. And they may have grown up without their parents showing that kind of interest in them. They are sometimes hesitant or confused at first when they are given the opportunity to look into their own mind and to speak their mind. But this is the one thing that they need the most. In order to really learn something in your bones, to learn it in your heart for real, you need to be in touch with your heart. A teacher who encourages that self-awareness is going beyond simply feeding you ideas and information. He is helping you cultivate your own innate wisdom. Your talent lies in your heart. Being born with a natural coordination for your instrument is a great help. Having the abilities to learn music quickly, to memorize it, and to understand it intellectually, is definitely an asset if you want to be a professional musician. But the essence of your talent is your deep feeling for music. This is what will carry you through all the work it takes to become the musician you want to be. And this is what a teacher is most responsible for as he helps you develop the many skills you need. Teachers are not all-knowing, divine beings. They need feedback from their students just as parents need feedback from their children. A child who is used to being respected by her parents may often say something like, “You don’t understand, mommy. This is what I really mean,” and then go on to surprise her mother with how much insight she actually has already. Students need the space to talk in a similar way to their teachers. If you sense that there is room for you to express yourself in such a way to your teacher, I encourage you to take full advantage of it. The more your teacher understands about how you think and feel—about the music or about their teaching, or about anything else related to your learning experience—the better equipped they are to guide you toward developing your full potential. Asking questions when you don’t understand something your teacher advises, speaking up if your teacher is unkind or impatient, and in general, letting your teacher know what is going on with you in your practicing and in your lesson experience, is part of your responsibility as a student and musician. You and your teacher should function as a team, committed to your musical growth. If your teacher does not encourage this kind of healthy relationship, seriously consider looking for a new teacher. The human heart is extremely powerful. It is also extremely delicate. At any moment, we have the power as teachers to either encourage our student’s heart to open or to frighten it into closing. The right word said at the right moment can create such a beautiful flowering in a student’s playing. Our primary job as teachers is to look for those words and those moments. If we listen with our whole heart to each moment of our interaction with a student—just as we listen with our whole heart to every sound of a beautiful performance—we can find those moments of beautiful connection with each student and help them connection with themselves. There is no greater gift we can give them. If you would like to develop these abilities as a teacher, I invite you to attend The Art of Practicing Institute’s 2015 Summer Program,or come for a free consultation. To find a teacher of the Art of Practicing in your area, you can check the Faculty page of the new website for The Art of Practicing Institute. What experience do I want my students to have? Do I have great confidence in my understanding of technique and musicianship and in my ability to communicate what I know? What kinds of questions can I ask students during lessons that will help them understand and express their own insights and feelings about the music and how they are playing it? Can I become more aware of things I do or say that interfere with the student’s self-awareness in lessons? 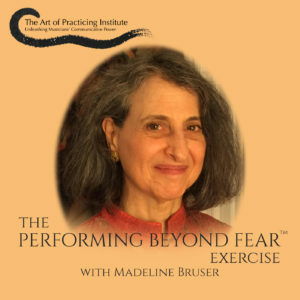 How can I encourage self-awareness in practicing? In what ways can I convey my belief in the student’s intelligence and talent? If you ask yourself such questions throughout your teaching career, you will help each of your students develop into who they are meant to be. You will also find out who you are meant to be as a teacher. And in my experience, that can be a most exciting revelation. Often when I practice a lot, things get worse and worse instead of better. Why does that happen? And what advice do you have? It’s great that you are curious about this phenomenon. It happens to many musicians, and I think it’s one of the most important questions to ask. More doesn’t equal better. It’s the quality, not the quantity of your practicing that makes all the difference. Whenever you notice that your practicing is only making you feel worse instead of better, it’s a good idea to just stop. Just stop in your tracks and hit the reset button. You can do this by simply sitting still for a little while and waiting until you notice a shift in your state of mind. This kind of shift is actually something you can feel. If you know how to do some kind of basic mindfulness meditation, or another technique for relaxing the mind, that can help you accomplish such a shift more efficiently. It always amazes me what a difference a few minutes of mental rest can make in my day. Sometimes even a few seconds here and there during a practice session can change the whole time you spend with your instrument. Little pockets of relaxation actually need to happen between notes even. Just a sense of being unhurried, no matter how fast you are playing or how much you have to do in the time you have. Somehow, paradoxically, going slower gets you there faster. Taking our time this way nourishes our whole body as well as our mind. In addition to simply letting your mind relax, it can be extremely helpful to deliberately focus your mind on something that opens your heart. As soon as you let go of whatever you’re preoccupied with and reflect on something you are grateful for, or someone you love, or something you find beautiful in your surroundings or in the music, it can slow down the racing mind and settle you back into yourself, into a sense of being at home and comfortable. From such a state of greater appreciation of your life experience, you can feel liberated from habitual stress. You can reconnect with your deeper self. This is the best place to make music from and to accomplish good things from. If this kind of mental relaxation isn’t sufficient to improve your practicing, there are, of course, many other aspects of practicing to look at. You could consult my book for a lot of these things. You’re also welcome to contact me for a lesson, in person or on Skype. Submit a question for possible inclusion in a future issue of Fearless Performing.